The most prestigious beauty pageant in the world, The Miss Universe 2011 is took place at Credicard Hall in Sao Polo, Brazil on September 12, 2011. A record 89 beauties from as many countries and territories across the world compete for the crown, The Miss Universe 2011. Miss Angola 2011, Leila Lopes has been crowned Miss Universe 2011 by Miss Universe 2010 Ximena Navarrete of Mexico. Angola’s first Miss Universe winner, Leila beat out 88 other contestants to win the title during the 60th anniversary of the world’s biggest beauty pageant. The first runner-up was Olesya Stefanko of Ukraine and the second runner-up was Priscila Machado of Brazil. The third was Shamcey Supsup of Philippines and the fourth was Luo Zilin of China. Ronnia Fornstedt from Sweden won the Miss Photogenic award and Nikolina Lončar from Montenegro won the Miss Congeniality award. 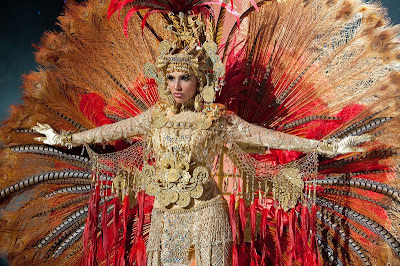 Sheldry Saez from Panama won the Best National Costume award.